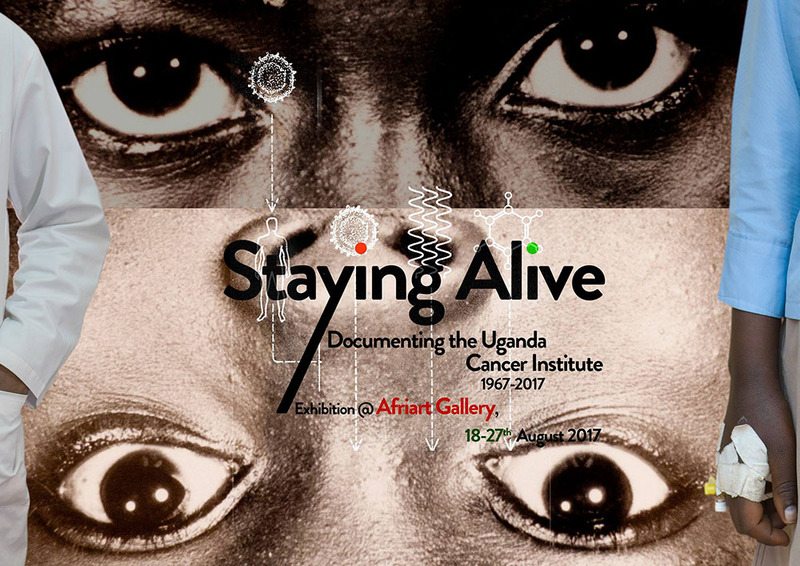 This is a continuation of the previous blog post with which we started to work our way towards the exhibition and book launch of Staying Alive, Documenting the Uganda Cancer Institute. 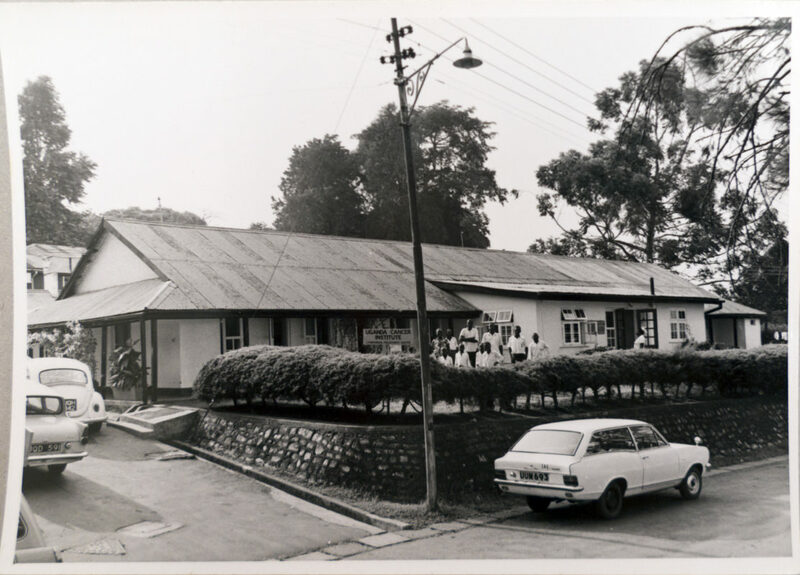 In that post Marissa Mika introduced herself by sharing some thoughts about the photographs she came across in her research on the history of the institute that celebrates its 50th anniversary this year. This time we will further introduce some of the Very Important People (V.I.P.) of the early days of the institute. Next to the V.I.P.’s this post discusses the historical photographs as Very Important Objects (V.I.O.) by pointing out some of their characteristics and materiality. The pictures that Marissa Mika came across in her research have two different materialities; prints and slides. There is a big difference between these two kinds of image objects that is easily forgotten when viewing the photographs they carry on a screen. Slides can only be seen if light pours through them, prints are paper objects that we can see because light is reflected from them. I did not handle the slides myself. They were scanned in the US. I can tell that they were framed by the black borders in the scans. This is where the plastic or cardboard frame of the slide stops light from coming through. I am glad these borders were not cropped out. Next to the contrast that is specific for colour transparencies, these frames make the photographs ‘readable’ as slides. 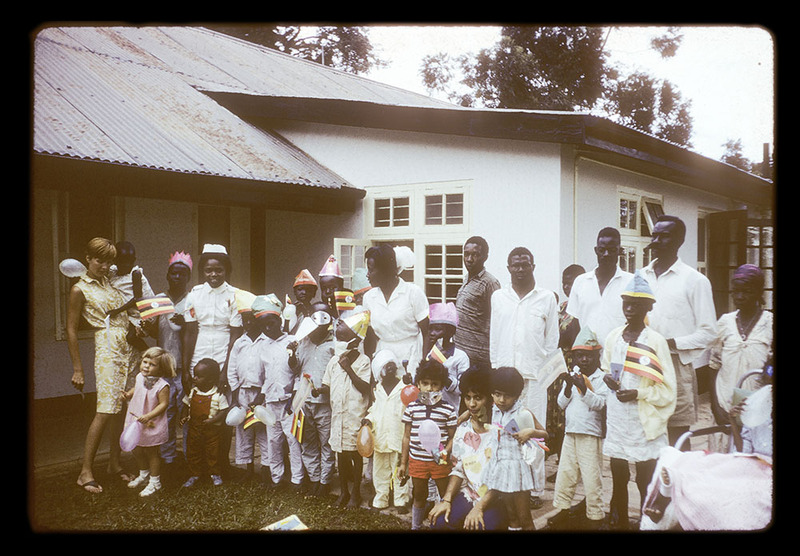 The prints were brought to Uganda by Marissa. They were photographed by HIPUganda, partly on the concrete floor outside of the UCI, partly on top of grey cardboard. These conditions are far from perfect. The shiny surfaces of the photographs sometimes caused reflections that were avoided by making the reproductions in an angle. Trying to at least to some extent keep the feel of the slides and prints present, the surfaces surrounding the pictures are not cropped out when showing the photographs here, or in book or exhibition. Below: Late 1960s. Standing with glasses Dr. Chuck Vogel, Director of the Solid Tumour Centre. We’d love to hear if someone can identify people not yet recognised in this or other photographs. His [Denis Burkitt’s] salary in 1946 was £ 600 per year and the only piece of research apparatus was a rather inferior camera. A room was set aside in his house and converted into a dark room for photographic work – an old camera served with some modifications, as an enlarger and endless clinical photographs were processed. 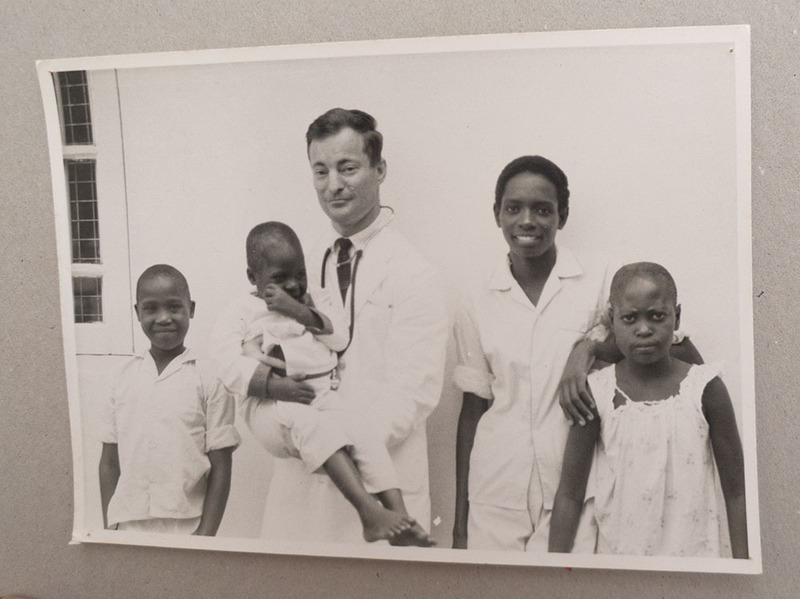 In the days when written records were of little value in retrospective studies, these photographs proved a useful way to collect data on which to establish facts about the disease patterns in Uganda. How often have I heard him say, when faced with an unusual clinical problem, “we have had several patients with this condition before”, and a few hours later produce photographic proof. And so it was with the Tumour that now bears his name. 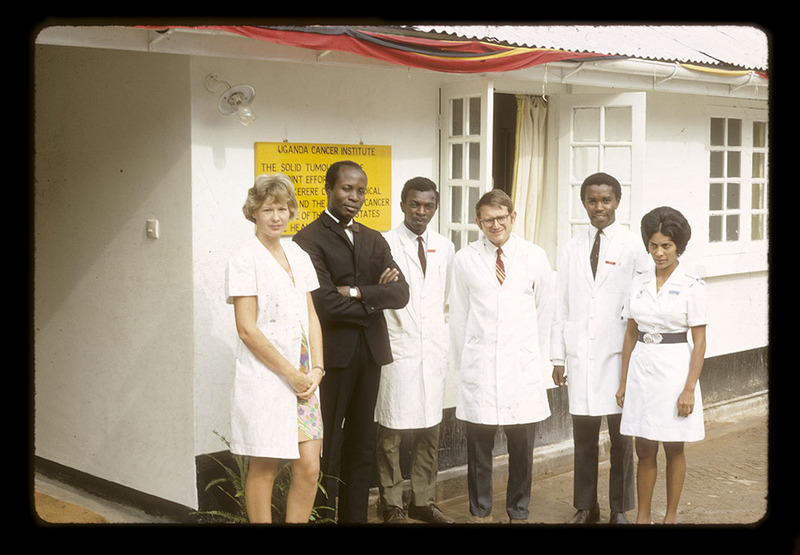 At one of the Saturday morning Mulago clinical meetings he showed a series of photographs of jaw and abdominal tumours and with simple reasoning told the pathologist that if this tumour was, in fact, what they were diagnosing (a neuroblastoma) when we were seeing this condition at Mulago 10 times – perhaps a 100 times – more often than in Europe. Looking back, this was a most pregnant moment and one that I remember very clearly. Most of the people I communicate with about this work are fellow academics and I often use the photographs as a way to underscore the analytical punchline. 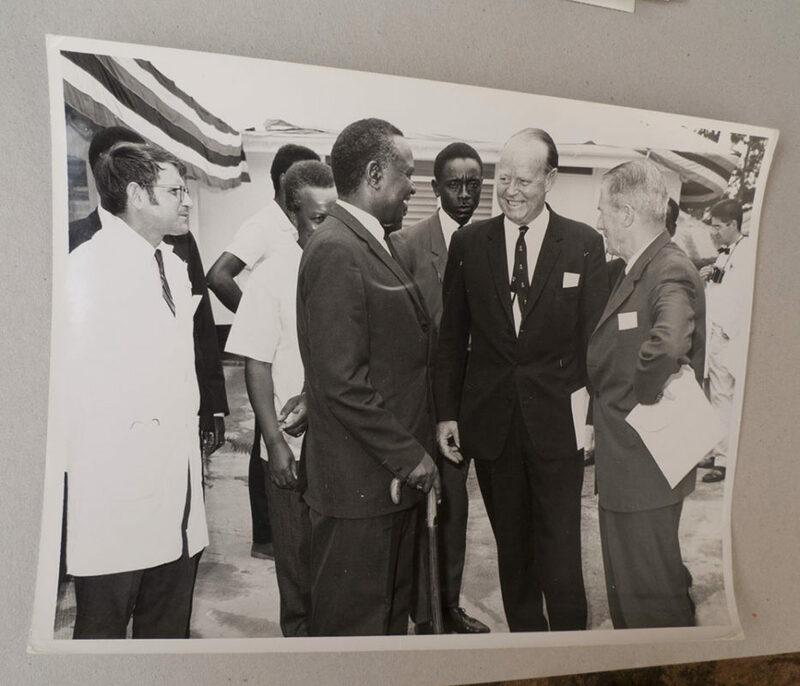 For example, I’ve argued that from the very beginning the Uganda Cancer Institute was established with a strong mandate for Africanization, and that Idi Amin’s presidency hit the accelerator on processes of biomedical knowledge, technology, and practice transfer that were already happening at the Institute. The opening ceremonies of the LTC and the STC visually illustrate what my words cannot. 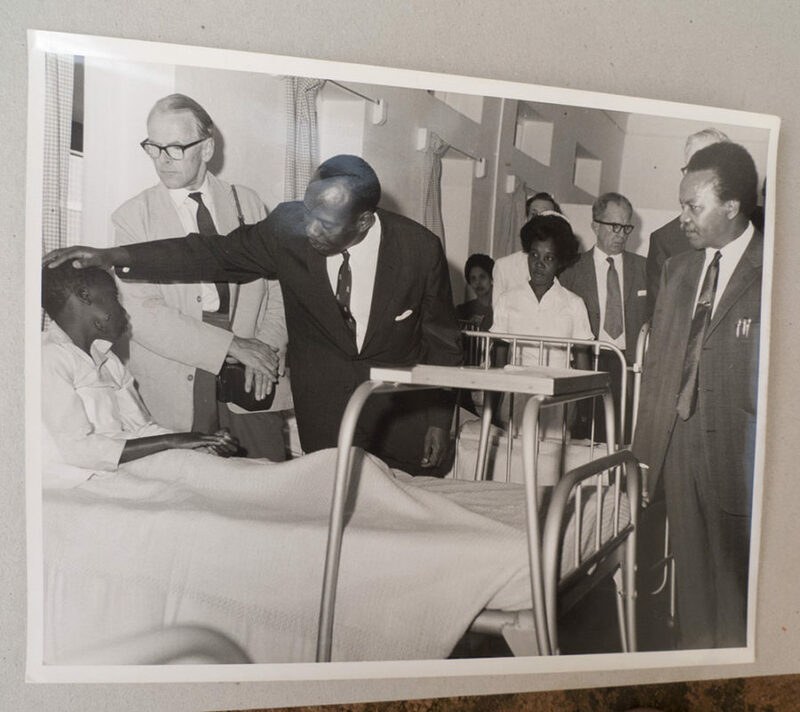 In one image Denis Burkitt looks on as Sebastian Kyalwazi conducts a bedside exam. 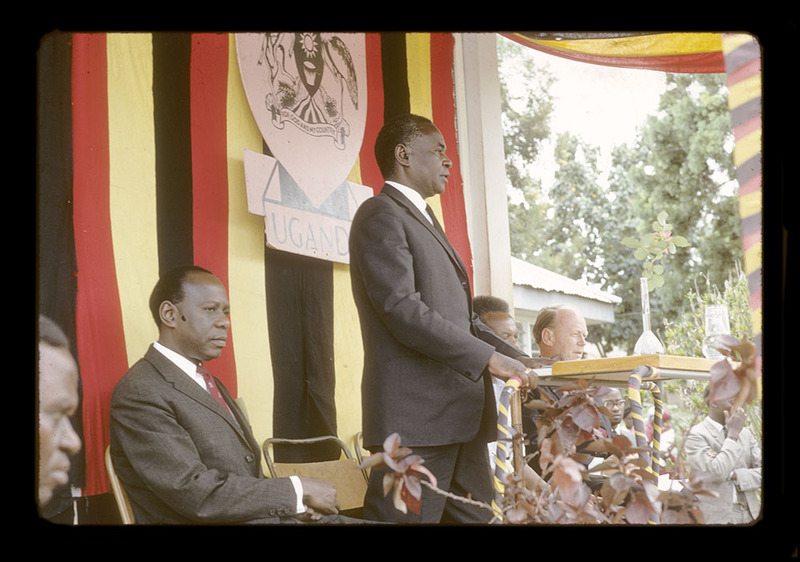 The photographs of the opening speeches show a stage decorated in the finest black, gold, and red colors of Ugandan national pride. Patients pose outside of the LTC to celebrate independence day waving flags and wearing fantastic hats. I love these scenes and share them widely in presentations. 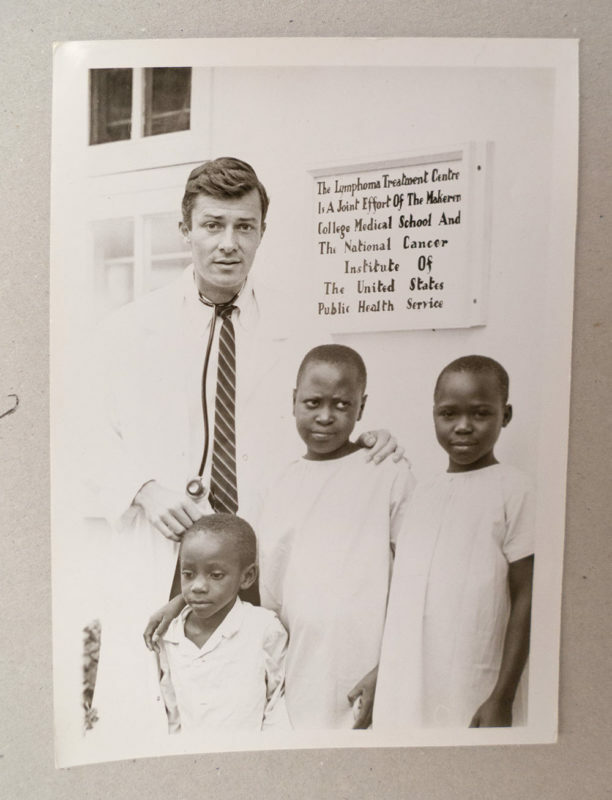 Dr. Ziegler came to Kampala under the auspices of the American National Cancer Institute with the task of establishing a small cancer chemotherapy clinical trials research unit—the Lymphoma Treatment Center—that would examine the long-term survival outcomes of treating Burkitt’s lymphoma. 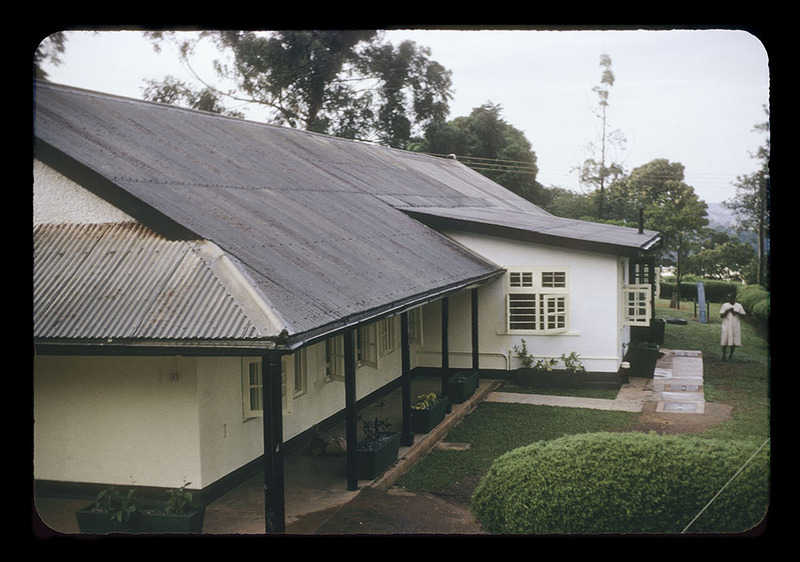 A collaborative project between the Ugandan Ministry of Health, the Makerere Medical School’s Department of Surgery, the National Cancer Institute, and the British Empire Cancer Campaign, the Lymphoma Treatment Center was, not supposed to provide comprehensive cancer care for the Ugandan population. In the next post we will speak about the different photographic genres that are present in the photo collection and the pasts they present, the characteristics they have and the appeals they (can) make on viewers.